From the Anvil door knobs are both elegant and unique door furniture pieces, which can give any door a special and stylish look. 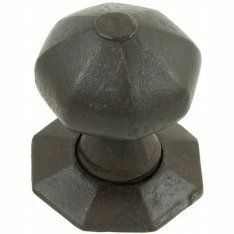 At Ironmongery Experts, we supply various styles of door knobs, from vintage-looking door knobs, such as octagonal door knobs and Tewkesbury square door knobs to more modern and simple door knobs, such as mushroom door knobs and ball door knobs. These door knobs are often used in interior doors and can be paired with a range of our door locks, for added privacy and security. To maintain the colours and texture of these unique door knobs, we would recommend purchasing From the Anvil’s beeswax maintenance wax. This beeswax finish will protect ironmongery products and restore their beautiful finish. Although door knobs are an excellent choice for a variety of settings, we also supply a wide range of other From the Anvil door handles, including lever handles on a backplate and lever handles on rose. All of these handles are handcrafted by British artisans, making each piece unique and perfect for any home or commercial building looking for an exclusive and functional door furniture piece. For exterior doors such as garden gates, cottage barn doors and shed doors, we have available a selection of door latches, which come in various finishes, such as black, pewter and beeswax. Most of our latches have left and right-hand variations to suit all requirements.